Here is a bonus post for you today. I made a dish of my family’s favorite baked beans for the holiday tomorrow and decided to snap a picture and share them with you. I think every backyard barbecue tomorrow will have a version of baked beans. I’m pretty sure it’s the law! In a large skillet over medium heat, saute the bacon until almost cooked, but not too crisp. Remove from the skillet with a slotted spoon and place in a large bowl. Drain all but about 1 tablespoon of the bacon grease from the skillet and add the onion and green pepper, if using. Sauté for a few minutes to soften. Add to the large bowl with the bacon. Into the large bowl add the undrained pork and beans, the 2 cans of rinsed and drained beans and the rest of the ingredients and mix well. Pour into a 9 x 13 inch dish. Bake covered at 325 degrees for 45 minutes. Uncover and continue baking for 20-25 more minutes. Sometimes I add a Chipotle Chile with a little of the adobo sauce that has been finely diced. You know I can't get enough of those! It is also delicious to turn them into "cowboy" beans (what Nanny called them) and add cooked ground beef or sausage. 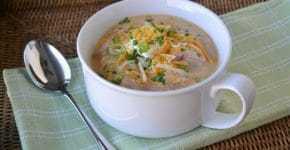 Linked to Everyday Mom’s Meals Church Supper and our very own Weekend Potluck. YUM! 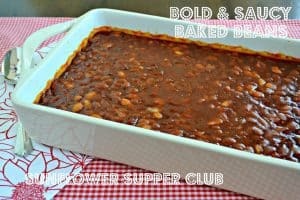 I made baked beans often, but next time I am going to try these… they look so yummy. Thanks for sharing them at foodie friends friday! Thanks Marly! I just found your link party and love it! Thanks for visiting us. Have a wonderful weekend! Oh I love baked beans! I usually open a couple of cans (shh!) and then add a bunch of other things to them. I will pin this to try in the future! Thanks for sharing on Foodie Friends Friday!